The mood was intense on this frigid Thursday night in Bankers Hill. But inside the cozy WestBean cafe, 48 contestants battled to showcase their best latte art talents. It was the premier of the San Diego Coffee Network's 2018 events season. WestBean Bankers Hill celebrated their grand opening just over a month ago on January 13th. Bankers Hill is the third WestBean location, after the original location downtown on Broadway and their Liberty Public Market location. The brand new cafe is tastefully designed and stocked with all the best coffee tools and toys, including their brand new Synesso Cynchra espresso machine that all the baristas enjoyed trying out. James Coffee Co, WestBean's Bankers Hill neighbor, showed up with a delicious Honduran coffee to serve on pourover for all the attendees. 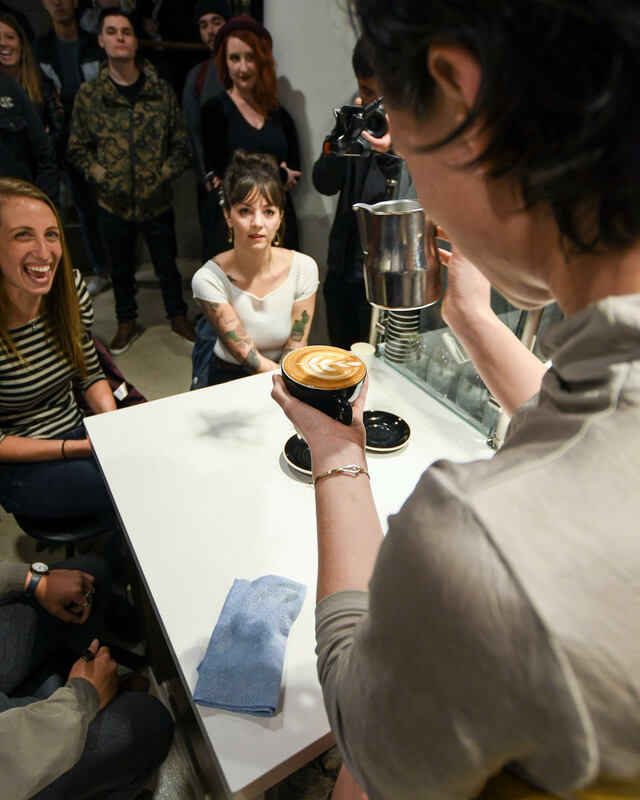 judging panel consisted of experts from different aspects of the coffee industry: Troy Truong of Sprocast, Lindsey Bania from Bird Rock Coffee Roasters and Lindsay Caddel, formerly of Augie's Coffee. Judges Troy of Sprocast, Lindsey of Bird Rock Coffee Roasters, and Lindsay, formerly of Augie's Coffee, make a tough choice between 2 excellent hearts in the gibraltar round. The digs…1st prize: cash prize, WestBean cold brew growler, Coffee Printed shirt, Das Cortez coffee, burlap tote from Bird Rock Coffee Roasters, sticker set from Department of Brewology, and the title of latte art champion for San Diego's February event! 2nd and 3rd place prizes: WestBean Coffee, Coffee Printed shirt, Bird Rock Coffee Roasters burlap tote, and stickers from Department of Brewology. SDCN is very grateful to our newest prize sponsor, Coffee Printed! Coffee Printed uses a special screenprinting process with ink made from spent coffee grounds! So what goes into a great work of art? At this throwdown, our judges were particularly on the lookout for the symmetry of the design, contrast, texture, level of difficulty, and overall creativity. Pouring steamed milk into espresso may not look that hard, but it requires lots of practice, skill, passion, and important but often overlooked….luck. One little bump, breeze, shaky hand, hiccup or stir can totally destroy your rosetta. This is what makes latte art so fun to watch! And don't forget that every latte made at the event is up for grabs! Any attendees wanting to drink a beautiful winning latte won't go thirsty. Not to mention, there’s always some great grub to pair with that latte. Try the sliders at WestBean. They're delicious! Coffee Co), James (Sugar & Scribe), Big Jay (SproCast / Hawthorn Coffee), Margaret (WestBean) and Gerardo. It came down to a beautiful rosetta poured with perfect symmetry, great color infusion, and creative flow. The title of latte art champion went to Margaret from WestBean! It was also the first time at our throwdowns that a barista had won on her home turf! Noah from Public Square took 2nd place and Marco took 3rd place. At the end of the night, there are no winners or losers, just fun-loving people who appreciate coffee so much to take it this seriously. Thank you to our contestants, winners, judges, volunteers, and hosts at WestBean for graciously giving your time and location for our event. We are really stoked about our next event on March 8th that will be hosted by Achilles Coffee. Look out for our next champion! Is a rematch within reach?